For over 31 years, the Governors of Massachusetts, Maine, New Hampshire, Rhode Island and Vermont have proclaimed April as Safe Digging Month to help make Dig Safe a household name, and to remind residents to call 811 before any dig project. While our governors’ endorsement brings strong credibility to our cause, a Safe Digging Month declaration also grants us added visibility when kicking off our campaign in April. 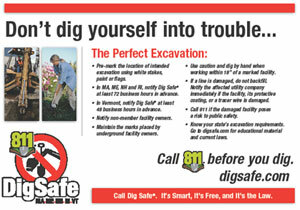 Dig Safe also supports Common Ground Alliance's National Safe Digging Month to raise 811 awareness nationwide. We believe that the key ingredient to a successful Damage Prevention program is a broad based campaign to get the word out. During the height of the excavation season from April to October, Dig Safe executes a far reaching multi-media promotion to heighten safe digging awareness among contractors and homeowners. And to be sure we are successful in reaching key audiences, Dig Safe conducts surveys regularly so that we continue our success in making the right media choices for maximum impact. 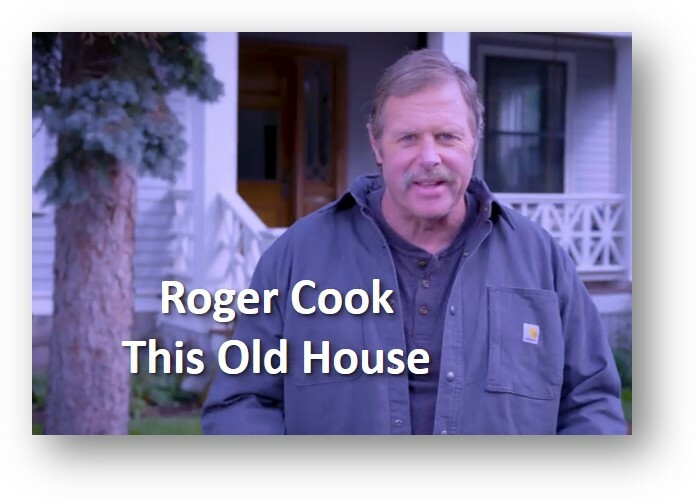 We couldn’t ask for a more suitable spokesperson than Roger Cook, landscape expert from WGBH’s hit shows This Old House and Ask This Old House. A well respected and locally famous professional, Roger is the perfect ambassador for urging our shared D-I-Y audience to call 811 before they dig. We thank Roger and the good folks at WGBH for making it happen. New England sports fans are nothing if not loyal, and they refuse to miss Sox and Pat’s games while driving, at the beach, and doing yard work. Sports radio has mass appeal with millions of listeners, and our live ads are broadcast over 48 New England radio stations throughout the season. …and, we fly a banner over crowded events, where it’s easy to see our safety message. When we fly our Call 811 banner over large crowds, thousands (upon thousands) of people see us overhead throughout the year. Dig Safe kicks off the season flying over the Boston Marathon in April - Safe Digging Month in Massachusetts and nationwide. We circle overhead at Boston’s Esplanade on July 4th to get the attention of over a half million people celebrating Independence Day. In July, NASCAR’s crowd of up to 91,000 fans at Loudon International Speedway will catch Dig Safe at the Sylvania 300 race. During the week of 811 Day (August 11) the Dig Safe banner is flown all over Cape Cod from Provincetown to Plymouth, and back. We also fly over the Falmouth Road Race, then head up the coast, from south shore beaches all the way to Hampton, New Hampshire. Over Labor Day Weekend, North Shore beachgoers can spot us from Beverly, Massachusetts up to Ogunquit Maine, and then back again. Patriots fans tailgating around Gillette Stadium will see our Call 811 banner before the game. Also, we're excited to have added to our flight line-up the Newport Jazz Festival, Laconia Bike Rally, and the Champlain Valley Fair in Essex, Vermont. We rely on the world’s most popular search engine to drive people to our website. Try Googling us using specific keywords (we’ve got over 200 different word combinations) and our ad and link appear. The clicks keep coming! Follow us on FaceBook and Twitter for upcoming events, helpful tips, law changes, and good conversation about all things Dig Safe. On August 11th (8/11 day!) Dig Safe will remind Joe and Jane Public to call 811 with newspaper ads in the Boston Globe, Portland Press Herald, Bangor Daily News, New Hampshire Union Leader, Providence Journal, and Burlington Free Press. Our ad also appears in over 25 trade publications in five states to reach industry stakeholders. Dig Safe is present at over 25 trade shows and events each year throughout Massachusetts, Maine, New Hampshire, Rhode Island and Vermont. Representatives are on hand to distribute educational material, answer questions, and to encourage municipalities to become Dig Safe members. Contractors also learn how Quick-Ticket, our web-based ticketing program, helps them make the most of their time. Our ever-popular freebies (give-a-ways, handouts, schwag, chotchkies, we’ve heard them called many things) keep our phone number and website conveniently on hand. We’re happy to provide these items to companies, associations, and community groups for their own Safety Days, training sessions, and other events. Click here to order these items for your own crew! At the end of the year we send approximately 27,000 letters to area contractors, highlighting new law changes, call center technologies, and industry trends. We include a list of emergency gas phone numbers by the Northeast Gas Association, and a Customer Service survey to make certain that we provide the best possible service for our callers. 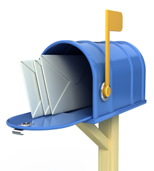 Dig Safe member utility companies have an enormous impact on Dig Safe awareness through their own promotions, such as write-ups in customer newsletters, on bill inserts, and on their websites. A great resource to incorporate 811 messaging into your own company’s plans is the Campaign Materials and Media Toolkit at https://commongroundalliance.com/damage-prevention/toolkits, a national program developed by the Common Ground Alliance.